The image hasn’t changed but the winery certainly has over the years. In 2010 when I moved to Belleville, I visited Sandbanks again. The outdoor pavilion had been replaced by a separate building that looked very like the Surf shop on a beach surrounded by colourful Muskoka chairs in yellows, orange, and blue, flower beds and the same youthful exuberance in their staff. On that visit, Catherine Langlois, owner and winemaker, was teaching people how to tie up and prune vines and giving away Baco Noir plants to put in their own gardens. It totally made my day. We went home and planted our two little Baco Noir plants. Over the next four years they took over our garden fence and I watched grapes grow, saw the beauty of veraison when they change colours and cursed as the robins stripped all the fruit off the vines as soon as it was ripe. My Belleville suburban neighbours would not have appreciated the sound cannons and the recorded shrieks of birds of prey needed to scare them off. As Sandbanks wines are so accessible in the LCBO, I hadn’t been back for five years and today, I got to tour the newest expansion. The veranda now extends around three sides of the winery, there is a promenade with a gazebo at the front, an area of shaded picnic tables, and additional tasting rooms added at the back and upstairs for groupz. The walls glow with the sunny abstracts of sun, sand and water painted by Catherine’s mother. Catherine took me to her new production site, and we passed that first tiny basement shop in her home and the roofed outdoor wine bar, now just used by family. The new production facility is huge and I was overawed by the size and number of the tanks. Just as she keeps the original store site as a reminder of the early days, Her very first tank, a remodelled dairy tank that held her first batch of wine, stands amid the forest of enormous stainless steel tanks. She still remembers how afraid she was that she would never be able to sell the huge quantity of wine in that first tank. 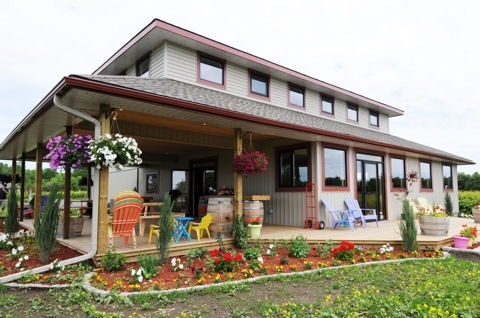 Although not the most prestigious winery in the County, Sandbanks is the most prolific .Over 25,000 cases of wine are produced each year in a range of vintages and blends from grapes grown on the estate, County and across Ontario. 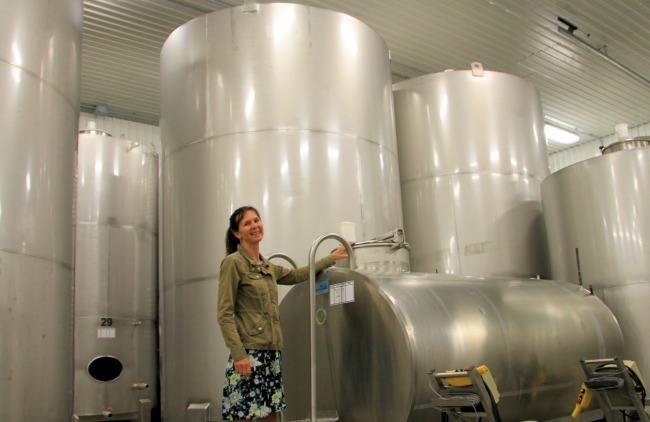 Unlike many of the County wineries that specialize in European vinifera, especially Pinot and Chardonnay, Catherine Langlois uses a variety of vinifera and hybrids. Her Reserve Baco Noir won double gold in the recent All Canadian Wine Championships and her Mouton Noir,a blend of Baco and Marechal Foch, is flying of the shelves along with vinifera whites like Riesling and Gewurztraminer. Fifteen years after planting the first vines, Sandbanks, the surfer winery, continues to ride the wave of success.